Well. The hard part is, anyway. The feeding and entertaining of flocks of family and relations who decend upon us. Actually, it wasn’t us this year, it was Tharyn’s parents who were doing the feeding and entertaining. So we got out of it quite easily. Before I continue on into far more freePBX related stuff, I must boast about how cool a wife I have. A couple of weeks ago, she said ‘I saw the coolest T-Shirt the other day.. It had “There’s no place like 127.0.0.1” on it’. We both laughed and I idly thought that I have a cool geek of a wife. It rolls around to Christmas day, I’ve got a pile of soft and squidgy presents from her. 7 T-shirts, and they’re all in full geek glory. Here’s a quick link to her page of them, but I’ll mention some of my favourites here. 31337 GEEK on the front, and ‘Have you tried turning it off and back on again? ?‘ on the back. It’s looking a bit worn in that photo, because I immediately put it on, on Christmas day. If you don’t know where the quote comes from, Google Video has plenty of vids of ‘The IT Crowd’. Go watch it. It’s hilarious. She had this shirt custom made. No I won’t fix your computer. I’m wearing that one right now, and I’m, uh, just about to go and fix someones computer. D’oh. red t-shirt. But it’s blue? No. It’s red. It says so right there! My software never has bugs. It just develops random features. It also has <GEEK> on the front and </GEEK> on the back. Coz there’s, you know, a Geek inside the tags. PEBKAC. Problem Exists Between Keyboard and Chair. Other outstanding bugs that need to be looked at before 2.2 is released is #1593 and #1575. #1532 is a bit harder to fix, due to the way we’re passing variable names backwards and forwards between perl, php and asterisk, so we try to avoid using single or double quotes whenever possible. It may not make it into 2.2, but it is something I want to fix. The other bugs aren’t terribly important, and most of them are module bugs anyway, which we can fix whenever we want. So we may have a 2.2 release out in early January. Yay! I hope you all enjoy your time off. I was hoping to take this week off, but the Bug Tracker was calling me! I’m also not going to be around very much towards the end of February and the beginning of March. I am actually, really, going to be taking a holiday. OK. So yes, I’ll be taking the laptop, and everywhere I’m staying has broadband, but still. I won’t have every day booked out like I usually do when I’m not at home. We’re all going to Tasmania (for the Yanks, that’s the island on the south eastern corner of Australia) for a week, and then going to Phillip Island to watch the World Superbikes. Yay! Jade’s been there before, but she was only a couple of months old then, so that doesn’t really count. Although she did seem to enjoy it. 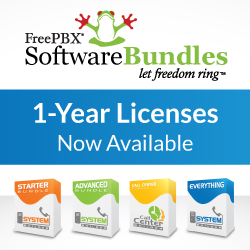 Next PostfreePBX 2.2.0 is here. Finally!